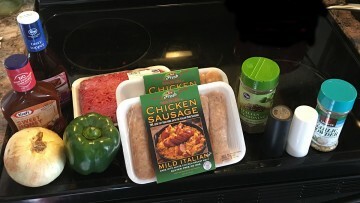 As part of our affiliation with the Atlanta Food Bloggers Society, we were offered a chance to sample some chicken sausage from First Fresh Foods. The challenge was to create a recipe using the First Fresh Foods Chicken Sausage and, of course, we’re among foodies so need I say more!?! #PassTheJoy: Can a Holiday Recipe that’s Healthy and Organic Be This Delicious? You Bet Your Jingle Bells! Linda Carmical, of DoFoodBetter.com and President of Atlanta Food Bloggers Society, hooked us up with Four Roses Bourbon for some holiday cooking and we had a wonderful time. I got a call from Melanie one afternoon, “There’s a box that came and its got a bottle of booze in it.